Second United Presbyterian Church in the Pittsburgh area of Wilkinsburg, PA, received a $10,000 DREAM Grant from the Presbyterian Church (U.S.A.) in 2016. DREAM Grants, which stands for Developmental, Risky, Experimental, Adaptive Mission, are the result of funds that have been given to support historic missions of the PCUSA, particularly among racial ethnic and rural populations. The congregation used the grant to start a program called “Making a Joyful Noise: Music Bridging the Gaps.” The following is a report on the program written by Second United Church Pastor Deb Warren and Clerk of Session Barb Kirk. This grant has been instrumental in allowing us to put in place and sustain using music as one way of bridging gaps between our church and the community, and between individuals in both the church and community as they have been able to enjoy music together. The Kids’ Club hired a music director who has taught the more than 30 children who attend to sing in parts and to sing in worship. The parents of these children who are not members of the congregation come to see and hear their children sing. This music director so enjoyed working with the children that she is volunteering for a second year. The music time is one part of the Kids’ Club that also includes games, a Bible story with discussion and dinner. The DREAM grant also enabled us to bring in the Simple Gifts folk music group that presented a week-long summer music camp culminating in a community dinner and concert. The final concert included many children who were invited to join in and play a variety of interesting musical instruments used in Appalachia. This event was a joyful and fun experience that brought many of our neighbors into the church space, some for the first time. We also offered “Music in the Park” during the summer months. Under the wide branches of the very old trees on the park next to the church, anyone in the neighborhood who wanted to join in the adult choir to sing various styles of music was welcome to do so. 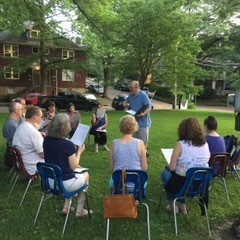 During their rehearsal, other families and children enjoyed free Sno Cones, played Frisbee golf, horseshoes and corn hole, and just enjoyed getting to know one another with choral music as a pleasant background. We ended the summer with a neighborhood picnic. 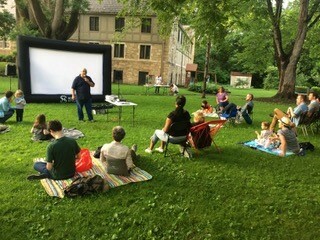 The borough where our church is located was so pleased with the community interaction from the “Joyful Noise in the Park” that they joined with us in hosting outdoor summer movie nights. These events clearly have paved the way to create more interaction in a neighborhood that is experiencing an uplifting change in character as more families are moving in, and readily taking advantage of the opportunities for children and young people to get together for fun, as well as for worship and service. This past week a new Neighborhood Watch group gathered in our building. We are looking for ongoing creative ways and support to build upon and sustain this promising foundation. Our next project is to remodel our large worship space in order to better suit the worship style of this generation, and to take advantage of a very large space that we need to be able to use.